Most people spend a good amount of time in the bathroom. Whether getting ready for work or play, or relaxing after a tough day (with plenty of bubbles), your bath and vanity surroundings should be attractive and special—and this includes your lighting. Make a statement with these top 10 unexpected looks. Though the Modern Forms Vetri LED Bath Bar has the familiar rectangular silhouette that many bath bars have in common, it has something many do not: sparkle. 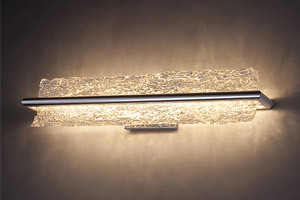 Its hand-formed glass panel is created in a 13th-century style that leaves rippling strand-like striations in the glass, allowing it to catch the light even when not illuminated. When it is, however, the shine and reflection it casts on walls is nothing short of spectacular. With a name that means "window" in Spanish, the Ventana Wall Sconce by Tech Lighting offers a window into a dynamically designed bath. 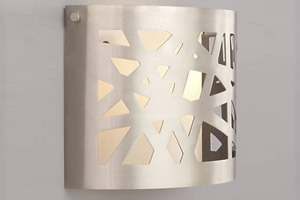 Its decorative metal shade is pierced with asymmetric cutouts that allow light from inside the inner glass shade to peek through, which attracts the eye to its unusual pattern. This strong transitional look complements super modern and more relaxed interiors alike. An unusual presentation when it comes to bath lighting, the SONNEMAN Lighting Lattice LED Bath Bar features a series of five small, staggered LED panels interconnected in an almost haphazard horizontal pattern. The uneven display is a welcome alternative to the straight-row seamlessness found in most bath bars, and is a definite consideration for contemporary spaces. In this case, the name really says it all. 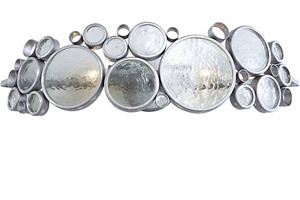 The Varaluz Fascination Bath Bar is a captivating collection of recycled glass discs encircled in recycled steel, so its pedigree is interesting enough. But what truly stands out is its design, with its discs of varying size artfully arranged in a linear silhouette. The idea of a bath bar remains, but the conventional is left far behind. Flash and sparkle aren't the only ways to add vigor to your vanity. Structural, sculptural selections like the Marsimik Bath Bar by élan Lighting retain a clean and contemporary profile that is elegant as well as interesting. Angles rise and recede along the chic white silhouette, creating a minimal yet totally engaging look that's perfectly at home in the ultra-modern bath. 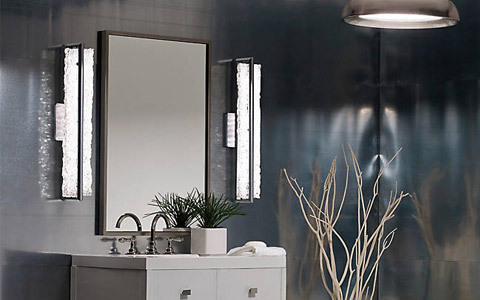 Adding a touch of the avant-garde turns the basic bathroom into a fashion-forward retreat. A playful, tongue-in-cheek statement, the LBL Lighting Lola 2-Light Bath Bar is a fun way to enliven a bath or vanity while remaining utterly chic. 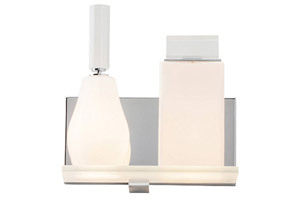 Inspired by a perfume shop, the glass bottles have solid crystal stoppers and glow softly from inside when lit. Nothing quite says luxury like a big bunch of bling. 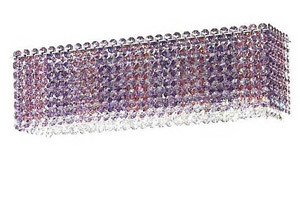 For those inclined to sparkling objects, the Schonbek Lighting Matrix Bath Bar brings a dazzling display of Swarovski crystal to the adventurous bathroom vanity. A straightforward, rectangular silhouette means all that glitter doesn’t overwhelm, allowing the shimmering colors to stand out among both simple and lavish design schemes. A classic art glass element is a sophisticated way to add character to interiors. 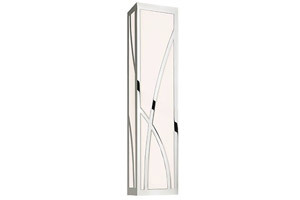 LBL Lighting's Mia Bath Bar brings a relaxing presence to vanities with glass cylinders accented by swirling ribbons. 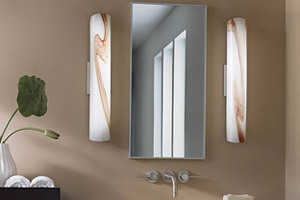 Flanking mirrors vertically or installed as a more traditional horizontal bath bar, this fixture impresses whether illuminated or not thanks to its high-quality Opal glass. 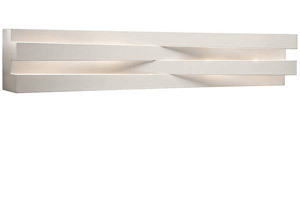 Organic yet starkly modern, SONNEMAN Lighting's Haiku LED Bath Bar has a strongly linear yet delicate presence. Well suited to a room with minimalist contemporary style, the gently arched metal tracery over the glass shade nevertheless offers a natural tranquility that is perfect for creating spa-like atmosphere. And it's fitted with efficient LED lights so you can relax about its energy consumption, too. 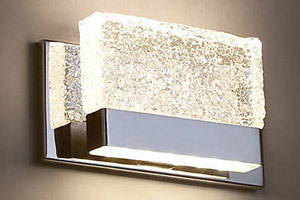 If you're needing a climate change in your bath, consider the Glacier LED Wall Sconce by Modern Forms. Its icy block of Piastra art glass glistens with the LED light that filters through it, casting pretty patterns on the wall. 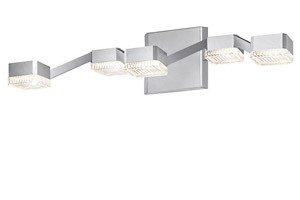 This fixture may be mounted with the steel trim and LEDs at the top or bottom, providing either ambient uplight or downlight that washes the wall with a warm glow.